Halton General Hospital in Runcorn is easily accessed by road being close to the North West motorway network. The hospital is located to the south of Runcorn just off the A533 Whitehall Expressway close to the M56 Motorway.We are within 30 minutes driving time from the cities of Manchester, Liverpool and Chester. The Cheshire and Merseyside Treatment Centre is on the same site. The postcode for the main Halton General hospital site is WA7 2DA. The postcode for the Cheshire and Merseyside Treatment Centre is WA7 2HH. The hospital campus is well served by public transport links. We work closely with the local councils to develop links to the hospitals. For information on all services call the national Traveline number on 0871 200 22 33 which can provide you with all public transport information you will need. Or use the Traveline Journey Planner to plan your journey to the hospital from your current location by clicking here. 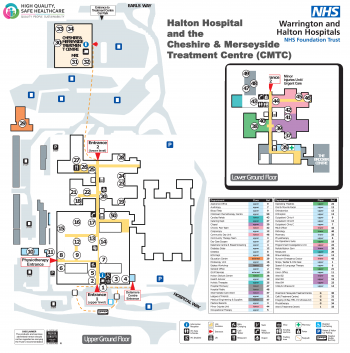 The Halton Borough Council travel and transport web page has a range of information on the travel links to Halton General Hospital. There us a bus stop opposite the main entrance (please note that this stop is around a 10 minute walk through the main hospital to the Cheshire and Merseyside Treatment Centre). For bus services to the hospital please see Services 1, 2, 3A, 3C, 14, 20, 20A, 61, 62, 79C, 82A, 110 and X1 on the bus timetables page of their website which shows all the main pick up points for services. Runcorn East is the closest railway station to the hospital (approximately a 10 min bus journey). From Runcorn East use Service 1 to reach the Hospital. Services 14, 61, 62, 79C, 82A and 110 operate between Runcorn Mainline Railway Station and Halton Hospital (approximately a 20 min journey). A larger parking area opposite Entrance 2 and the Minor Injuries Unit (best for visiting the main wards). At the Cheshire and Merseyside Treatment Centre there is a parking area directly in front of the centre. All patient car parks are clearly sign posted. Our car parks are controlled by automatic number plate recognition systems. When paying at our machines you need to input your registration number into the machine. You can pay at any time on your visit before your departure as long as you pay for the time you have been parked for. All visitors (including blue badge holders) must pay for parking but there are a range of concessions which are outlined below. Please note that additional time is added to the tariff timings to allow vehicles to exit the site. You can pay at the pay machines which are located in and around the main entrance areas to the hospitals. You do not need to display your ticket in your car - but please keep your ticket as a receipt. The first 30 minutes on site are free (ie from entering the site to leaving) and means visitors and patients are allowed to park for that initial half an hour free of charge. We have introduced the 30 minute scheme based on patient feedback and hope it will suit visitors dropping off friends or relatives and accompanying them into the hospitals as well as patients who are visiting for quick pre-arranged tests, collecting prescriptions or making other quick visits. You can pay at any time during your visit (on entry or exit) as long as you pay for the time you have stayed. Cars not paying for their time on the car parks are subject to receiving a parking charge notice from our parking company Highview Parking. If a patient is likely to be kept in the hospital over 24 hours and their car is left on site, the daily charges of £6 will need to be paid to avoid receiving a fine or make arrangements with the cash office for a weekly saver pass. We offer a range of concessions on car parking charges for regular patients and visitors who need to attend hospital over an extended period. These concessions are designed to make the costs easier for people who need regular or long term treatment. Patients- £10.00 a week or £30.00 a month, dependent on your visits. Visitors- attending for an extended period should pay for their first 7 days parking, and then take the tickets from these sessions to the Cash Office, at which time a Weekly Saver Pass can be purchased. Cancer patients will be issued with a Concessionary permit form by the Delamere Centre and CANtreat Unit, which should then be presented at the Halton Cash Office, where a free Saver Pass will be issued. Patients attending any cancer related treatment at Warrington Hospitals should present their appointment letter or treatment details at the Cash Office where your registration number will be put onto the car parking database. Are eligible for free parking. This will happen automatically at Warrington. Patients at Halton will have the details endorsed by Ward staff and will then be entered onto the car parking database. Relatives who are currently visiting a patient who is receiving ‘End of Life’ care are eligible for free parking, and should ask the ward to contact the Cash Office to arrange this. Ward staff to endorse up to 3 vehicles which will then be entered onto the car parking database by the Cash Office. Please note that this doesn’t include palliative care patients. Patients are eligible for free parking for their visit please ensure that you provide your vehicle registration to the reception staff on booking in. Patients admitted urgently who have to leave their car on site for an extended period will be eligible for a Weekly Saver Pass. Unpaid Carers who hold a Carer Card and have been requested by a ward to assist in patient care will be eligible for free car parking. The ward will issue a Care Concessionary Parking Permit form. This form should be taken to the Cash Office/General Office where a permit will be issued for a week and can be renewed as necessary. Patients in receipt of certain benefits and allowances may be entitled to assistance with travel costs to hospital. Information and reimbursement may be obtained from the General Office at Halton General Hospital (located in the main reception).